George Graham Reviews Bill Evans' "Big Fun"
The idea of mixing rock and jazz goes back to the mid-1960, but jazz-rock fusion, as it came to be called, fully emerged as a genre in the 1970s, when a number of musicians, most of them veterans of Miles Davis' electric bands of the 1960s and Seventies, began to combine the electricity of rock with the musical complexity and high level of musicianship of jazz. Artists like John McLaughlin, Chick Corea, Herbie Hancock, and the members of Weather Report achieved fair amount of popularity and created some memorable recordings during the 1970s. Fusion faded from the scene from the 1980s on, when many of the same musicians grew tired of the loud electric sound, and moved back to acoustic music, though often with a new outlook. In recent years, a popular phenomenon called "smooth jazz" had reared its, many jazz purists would argue, ugly head, with popular artists like Kenny G playing a jazz instrument like the saxophone, but creating lightweight not-necessarily-instrumental pop that is anything but the free-flowing improvisational music that is jazz. So, that has left something of a void, from the former fusion players who have gone back to acoustic music, and the encroachment of the commercial smooth jazzers. But some worthwhile new fusion can be found from time to time, from artists like CAB, and Steve Smith's Vital Information, and of course from the Pat Metheny Group. This week we have a new recording by saxophonist Bill Evans that is upbeat and appealing, and is also has enough musical content and general "hipness" that it should satisfy long-time fusion fans. Interestingly, Bill Evans is also a veteran of Miles Davis' bands. This Bill Evans is not to be confused with the late jazz pianist Bill Evans, who also played in Miles Davis' group on the 1959 Kind of Blue album. Saxophonist Bill Evans was born in Illinois in 1958, and started out on piano but switched to tenor sax in high school, then moved to New York to study jazz at William Patterson college in New Jersey. By 1980, he had been recruited by Miles Davis, for whom Evans worked as a kind of manager of his bands, helping to recruit people like John Scofield and Mike Stern. Evans appeared on four Miles Davis albums until 1984, when he joined John McLaughlin's re-formed Mahavishu group. He was also part of the groups Elements and Petit Blonde, and released his first solo album in 1984. Throughout his career he has been carrying the torch for jazz-rock fusion, undertaking various varieties from nearly acoustic to hip-hop influenced. His new CD is called Big Fun, and it's both musically interesting often quite danceable, carrying a strong funk groove, though often with mainly acoustic instruments. The CD is fairly eclectic, ranging from something that comes dangerously close to smooth jazz, to a laid-back treatment of a 1960s anthem with Willie Nelson. Evans is joined by other notable guests, including jazz-rock pioneer Les McCann on vocals, and guitarist Robben Ford. Bruce Hornsby puts in a subtle appearance doing backing vocals on one track. Evans' regular band on the CD includes some first rate jazz and funk musicians, including Hiram Bullock on guitar, Clifford Carter, from the group Elements, and studio ace Ricky Peterson on keyboards, jazz bassist James Genus, who often plays primarily acoustic bass, even on the funky tunes, drummer Vinny Colaiuta, and percussionist Manolo Badrena. Also appearing on several tracks in Willie Nelson's long-time harmonica man Mickey Raphael. About the closest thing to a disappointment on this uniformly high quality album is Midnight Creeper, which though it boasts first-rate musicianship, is also imbued with a number of fusion and smooth-jazz clichés. Saxophonist Bill Evans was well aware that his former mentor, Miles Davis also released an album called Big Fun, and Evans was not trying to capitalize on that. 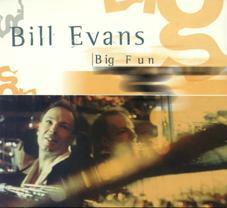 Instead Bill Evans named his CD Big Fun because that's how he described the atmosphere surrounding its making. The recording is one that conveys a combination of melodic and even dance appeal with musical sophistication and taste, generally eschewing the cloying aspects of the so-called "smooth jazz" that has largely supplanted what is left of the jazz-rock fusion scene. The CD is also more wide-ranging stylistically than most in the genre. After all, it's not every day that a Miles Davis alumnus had a guest vocal appearance by Willie Nelson. The result is a very satisfying album that makes great party music, or something you can sit down and studiously absorb for its musical content. Our grade for sound quality is about a B. The otherwise well-recorded album has most of its dynamics compressed out of it, with everything at about the same volume. Jazz rock fusion has had its ups and downs since its heyday in the 1970s, but the scene remains active and its artists creative. Bill Evans' Big Fun is an excellent example.